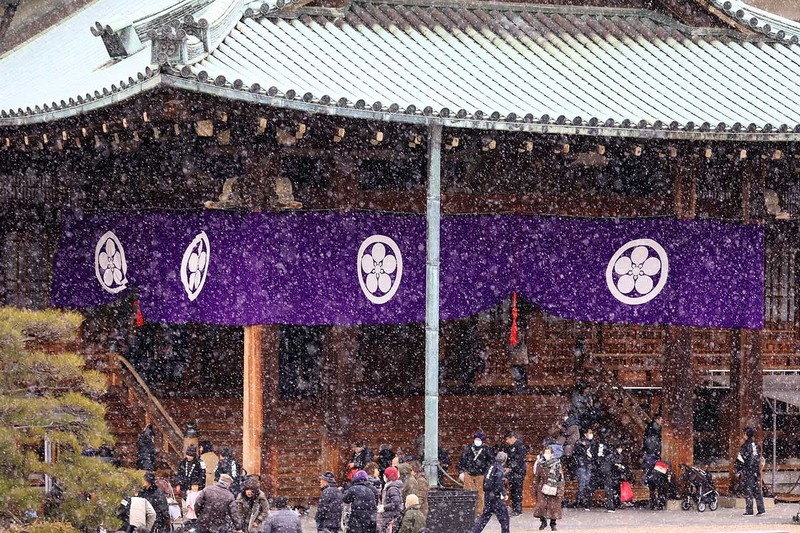 On January 26, the Spring Grand Service commemorating the day when Oyasama withdrew from physical life—namely, the lunar calendar date of January 26, 1887—was performed in the Main Sanctuary of Church Headquarters with the Shinbashira presiding as chief officiant. Approximately 58,000 followers from both within and outside Japan returned to Jiba to attend the Service. The prayer was followed by the joyous performance of the Kagura Service and the Dance with Hand Movements. 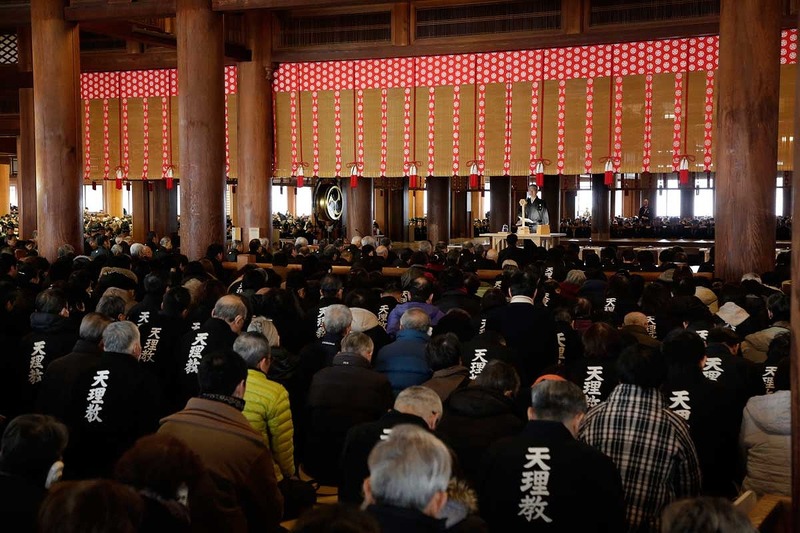 The followers, having filled the Worship Halls, the Corridors, and other areas in the Sanctuary precincts, joined together in singing the Mikagura-uta, the songs for the Service. 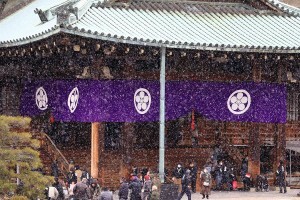 The Service concluded shortly before 2:00 p.m., the hour Oyasama withdrew from physical life. 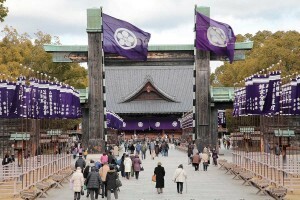 After he began delivering the sermon, the Shinbashira paused for a moment to offer a prayer in the direction of the Foundress’ Sanctuary at the sounding of the daily siren that signals the hour. 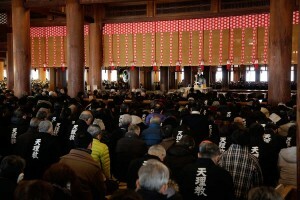 In the first half of the sermon, the Shinbashira, by referring to The Life of Oyasama, explained the historical background at the time of Oyasama’s withdrawal from physical life and the intense dialogue conducted between Oyasama and the first Shinbashira until the early followers brought themselves to perform the Service. Over 300 people from overseas countries and regions, including about 200 people from South Korea, returned to Jiba for the Spring Grand Service. The Shinbashira’s prayer and sermon were interpreted simultaneously into six languages: English, Chinese (Mandarin), Korean, Portuguese, Spanish, and Nepali. 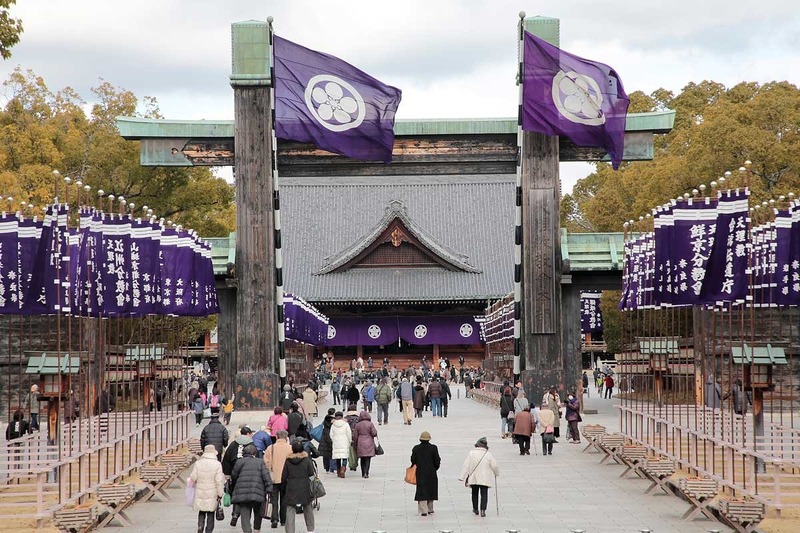 featured, Grand Service, shinbashira, Tenrikyo Church Headquarters.